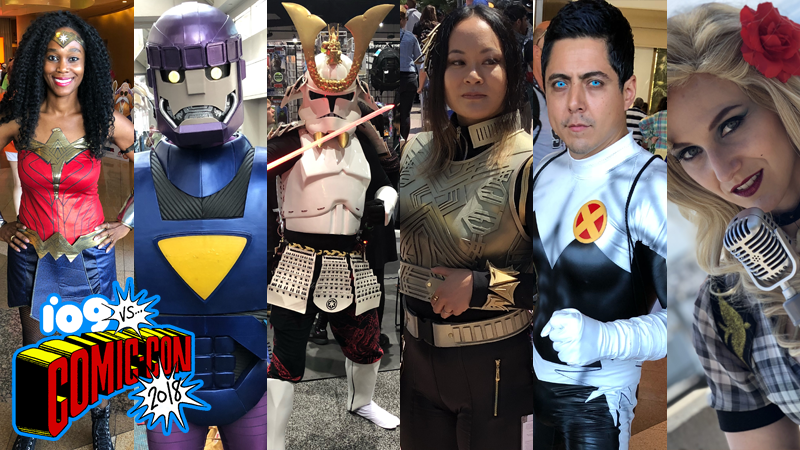 If you missed our past round ups, you can check out all the cosplay videos from the show floor in San Diego below, as well as a sampling of some of our very favorite cosplay photos snapped by io9's Comic-Con crew and from around the web. If you want to see even more con cosplay excellence, check out the related stories below! Business Galactus is still the best Galactus. Who you gonna call? Not these ghostbusters, obviously, they’re trying to enjoy a Comic-Con! Ms. Marvel is on the case! In the name of Betty White, and in the name of Batman, these sailor scouts will punish you! You don’t want to cross DC Bombshells’ version of Mera. Wakanda forever, even at Comic-Con. Hawkman and Hawkgirl are patrolling the streets of Comic-Con, like all good space-bird-cops. Oh no, this Batman Who Laughs brought some Robin pets with him! Samurai Clone, reporting for duty! With great power comes an even greater hairstyle for this Ultimate Spider-Woman. Seriously, if Westworld is real, there’d totally be a Comic-Con park, right? Dolores agrees, I think. Wonder Woman stands ready to save the day. B-Ball Spider-Men fight crime and play a mean game on the court. Electro is here to electrify Comic-Con. Bombshells’ Black Canary can definitely hit the high notes. Elastigirl, Jack-Jack, and Edna Mode probably spent Comic-Con checking out everyone else’s hot Comic-Con looks. The Assholes of Spaceballs fame were in attendance, proving that especially in 2018 you can’t escape the feeling of being surrounded by assholes. Go on, smile for the Joker’s camera. Hello, what have we here...some excellent Lando cosplay! To me, my tiny plastic X-Men...attack this Sentinel! You’d think Spidey would have quicker ways of getting around San Diego. Tom Riddle and Supergirl make for an unlikely team up to spread the gospel...according to J.K. Rowling? Game of Thrones’ Night King is #dadgoals. Wonder Woman and Steve Trevor, together again after all these years! These Knights of Stormwind from World of Warcraft stand as one—For the Alliance! The Arkham video game incarnations of Batman and Robin take to the busy streets of the Comic-Con show floor. X-Men’s Northstar races into San Diego at the speed of light! Is it a bird? Is it a plane? No, it’s superdog!